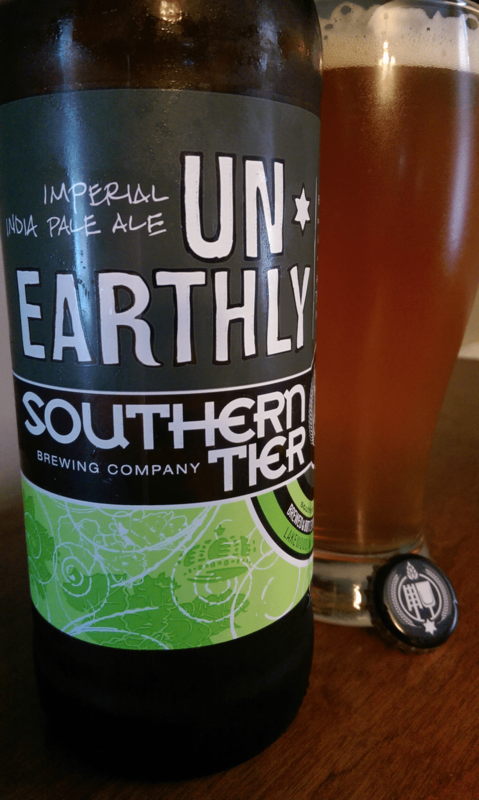 Beer Profile: Southern Tier UnEarthly Imperial IPA – Food. Beer. Stuff. Southern Tier began brewing in late 2002 and has been growing ever since now brewing over 90,000 barrels annually. Based out near Lake Erie in western New York, Southern Teir brews over 30 varieties including limited editions and rare styles. UnEarthly is a manifestation of the brewer’s craft; skillfully balancing art and the forces of nature to produce a divine liquid. Delicately pour a taste into a fluted glass. The enchanting aromas of the hops waft forward as your first sip divulges this beer’s fervent soul. To underestimate UnEarthly is to trifle with the mysteries of the Universe, so please consume wisely. Piney hops greet me as I pop the cap on this 22oz bottle. The pour creates an easy billowing head that slowly fades to a thick collar atop a light copper, moderately carbonated glass of beer. Sweet aromas give away the presence of crystal malts alluding to the skillful balance promised by the label despite the 150+ IBU count. UnEarthly pours a light semi transparent copper with billowing head. The hop aromas are strong as I take my first sip. Immediately I taste the sweet malts followed by a lingering bitterness. 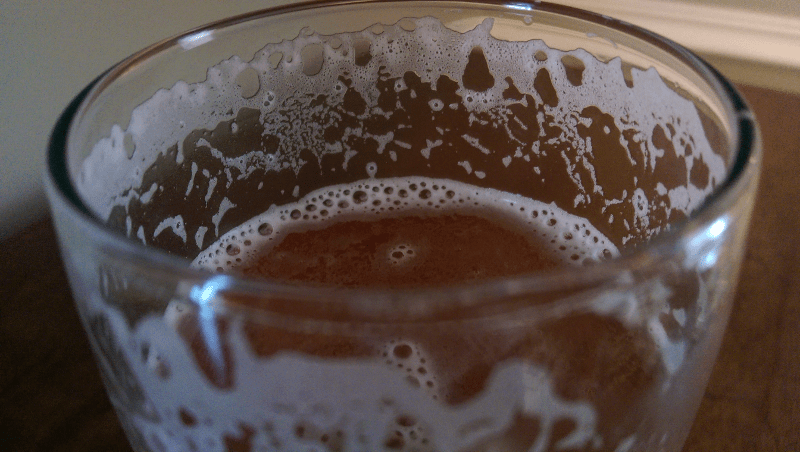 The carbonation sits lightly on the tongue. This is a sweet beer for sure but with loads of hop flavor on the back end. 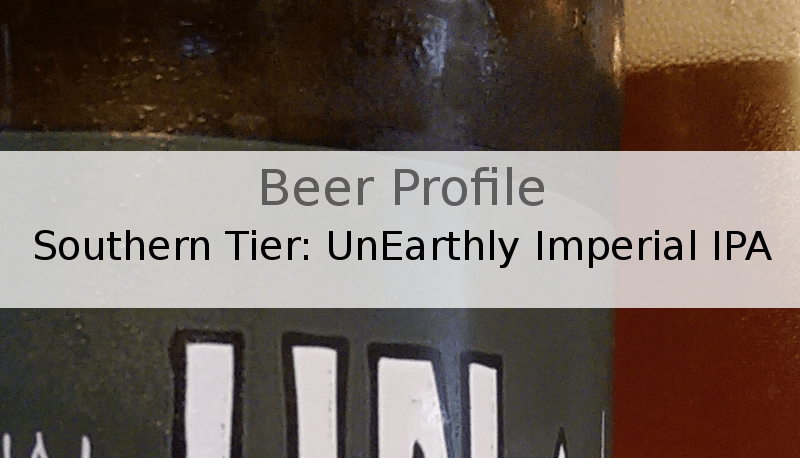 UnEarthly IPA is a medium bodied beer with a smooth yet sticky, resinous mouth feel. With the crystal malts, I also pickup citrus and floral undertones from the hops and a bit of a bready wheat beer flavor. The collar leaves lacing after every sip marking the glass. The collar continues to lace the glass as I imbibe. Southern Tier did not disappoint, this was a skillfully balanced beer for sure. Normally I’m not real big on IPA’s that lead with a crystal malt profile. A big hop lover, I savor that aspect personally, but with UnEarthly the light sweetness was a feature to be flaunted and didn’t sneak up on me so I was more than ready and able to enjoy this great example of American ingenuity. At 9.5% ABV it is telling that I didn’t mention the nice punch the 22oz gave me until now. UnEarthly hides its dark side very well and as I finish writing this up I am feeling quite buzzed. I found it to be very drinkable going down with ease and leaving me wishing I had bought two. Do yourself a favor and don’t repeat my mistake.